. . . and babies make four. : A giveaway and a chance to help. A giveaway and a chance to help. As you all know, adoption is near and dear to my heart. And I know that adoption is near and dear to the hearts of many of you who read this blog too. That's why I'd like to tell you about an amazing opportunity to help someone who is in the process of adopting a baby. Joe and Christy have been married for 13 years. They have been foster parents to six different children. They both work full time and Joe is a volunteer fire fighter. During the time they've been married they have endured multiple miscarriages, unsuccessful IVF treatments and an adoption where the birthmother changed her mind after the baby had been home with them for two days. They had used up all of their savings and had basically given up on their dream of being parents when Christy and Denise, the owner of Matilda Jane, reconnected. 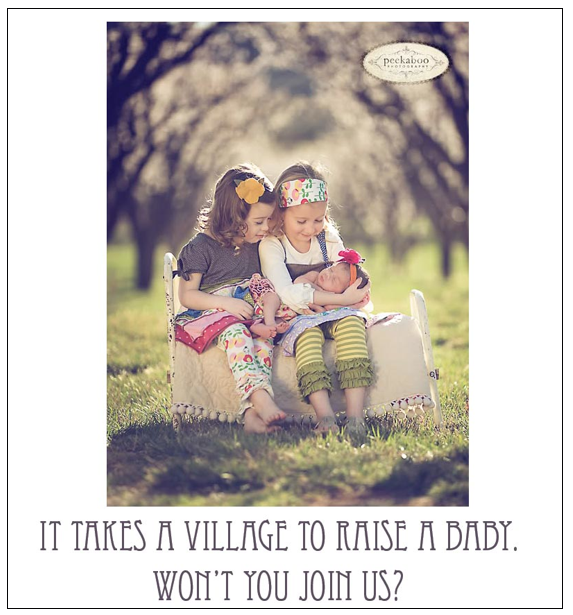 Christy told Denise about their struggle to become parents and Denise offered to hold a fundraising Matilda Jane Trunk Show for them with 80% of all sales going to help offset their adoption expenses. So, this coming Saturday, April 24, there will be a Matilda Jane Trunk Show at Mulligan's Restaurant in downtown Cheboygan, Michigan for Christy and Joe. Now I know that most of you don't live in Cheboygan, Michigan but if you call the Matilda Jane office on Friday, April 23 and tell them you're placing an order for Christy and Joe, 80% -- 80%! -- of your order will go to them. If you've ever thought about buying Matilda Jane Clothing I can't think of a better time to do it. Orders may be called in to the Matilda Jane office on Friday, April 23 ONLY at 260.424.3511. Make sure you tell them that it's for Christy and Joe. Plus, there's a giveaway for you. If you post about this on your blog or Facebook account, and come back here and tell me that you did, you'll be entered into a drawing for a little girls' Matilda Jane dress in your choice of size. You must come back and tell me by Thursday at 12:00 midnight. Thanks for helping someone's dream come true. Amazing! That is soooo generous of Denise!! I will post this on my site - - thank you for spreading the word! Thanks for letting everyone know so we can help their dream come true! It took me a bit to try to post! But i got it up on my facebook page Christy is one of my dearest friends and i want nothing more then for them to be able to have a family! Thank You so much for doing this for them! Love these clothes...love to help!! Posted about this on my blog today!! I have been holding off on my MJ order, so I will definitely call it in on the 23rd! I saw this on MJ's blog too! I have put this on FB! Well...I'm a prehistoric geek w/ no blog, or facebook, or anything. I follow just a handful of blogs that minister to me and that I can faithfully be in prayer for. But, just want to say I love the Lord and orphans/orphan care. Hello! I posted this to my Facebook! This is so cool!!!! Thanks for sharing and I will put it on my blog tomorrow!! It was nice catching up on your blog. You guys are quite the travelers!!! Have a blast on the west coast now!!! Posted on FB. Can't wait to see my grandaughter in the Felini Knot dress. Hope you earn lots of $'s! Wow. What a great way to help! I posted on my blog and linked back to yours.